From the Index Browser, you can easily apply an action on a set of indexed documents that you select individually or in lots from the search results (see Index Browser Available Actions). This feature is useful to independently treat sets of indexed documents that require maintenance. In the Index Browser, locate the documents on which you want to apply an action (see Finding Documents Using the Index Browser). Using the facets, ensure to select one collection and one source to activate the search results toolbar. In the search results, select the check box of individual documents on which you want to perform an action. 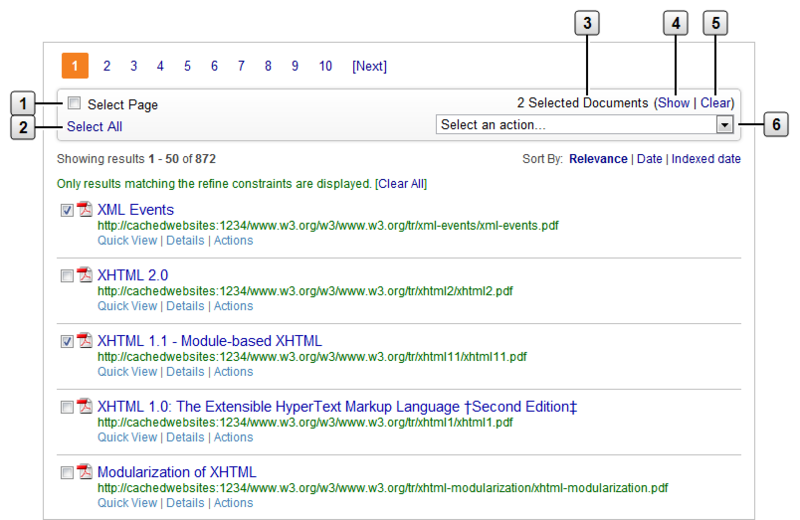 Use the search results toolbar items shown in the following example to select, show, or clear selected documents. Select this check box to select all the documents listed in the current search results page (50 in the example). Click to select all the documents returned by the current query (872 in the example). Indicates the number of currently selected documents. Click to show only the currently selected documents. Click to clear all currently selected documents and start a new selection. Select an action to apply to all the currently selected documents. Note: You can perform several queries and select documents from any of them to build a precise set of selected documents. When the currently selected documents are the ones on which you want to apply an action, on the search results toolbar, select the desired action to apply. The action is performed, a confirmation message appears at the top of the page, and the document selection is cleared. When adding Top Results, a dialog box appears to let you enter the queries (see Adding Top Results from the Index Browser). The list of available actions may vary depending on the type of sources to which the documents belong.